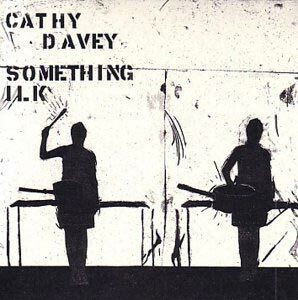 Cathy Davey is a busy woman indeed. Already this year she's toured with Supergrass and Graham Coxon as well as playing a handful of headlining dates in the UK and Ireland. Following on from her "Come Over" EP (her debut release back in April) is her debut album "Something Ilk". Recorded last summer with producer Ben Hillier, whose clients include Blur, at Rockfield Studios, Davey and her musicians experimented with natural sounds, pre-war microphones and old synthesizers resulting in an interesting, unusual and original listening experience. "Trade Secret" takes us on a dark journey of the soul. Using scratchy guitars and bizarrely an orchestra of yazoo players, Davey's vocal veers between the fragile sensitivity of Cerys Matters and the harsh brittleness of PJ Harvey with just a hint of Bjork. It's got an underground indie feel to it and Davey's lyrics underpin this sense of unease seamlessly. When she delivers the mantra "that's the price you pay" it chills the bones. A bit more light-hearted, but no less enjoyable is "Clean And Neat" which lyrically is more playful. A compendium of grunge, a fine grasp of pop sensibility, a memorable chorus and a keen understanding of melody. "Yak Yak" has gothic appeal written all over it. The acoustic guitar, drums and heavy bass reminds me of Carina Round with simply sleazy sounding guitars. If the Bad Seeds ditched Nick and recruited young Cathy it would sound not unlike this - menacing, moody and gradually lulling you into a false sense of security as seductively as possible. This is no easy undertaking. "Holy Moly" is atmospheric, features slide guitar and recalls Nirvana. The vocal is touch yet tender and the heavy rock overtones with a strong lead female voice is a dead ringer for Hole. Cathy reaches the high notes with ease as the song gradually builds and takes shape.